Do you know what today is? Now, this is a trick question. Think hard. Yes, it is Wednesday but that’s not the answer I’m looking for. Yes, it is December 11 but that’s not the answer I’m looking for either. It’s 2 weeks until Christmas!!! Yes, just 14 days left to get all your Christmas “to dos” completed!!! Since we are in count down mode and every moment is filled with things that “need to be done”, we thought we’d feature 5 free printables from last week’s Project Stash! If you were featured, strut your stuff and grab a “Featured” button! 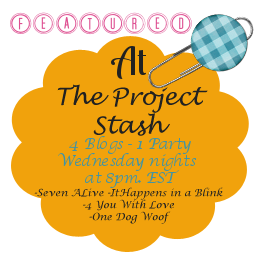 If you’re new around here, Wednesday at 8:00 pm EST The Project Stash link party goes live! Our weekly link party co-hosted by….. This means when you link up your post is shown on…..
« Homemade Holiday Party – Winners!